Book 11, the first of the later books of the Annals to survive, narrates two years in the reign of Claudius, AD 47-8. While Claudius is busy with the duties of his censorship, his wife Messalina is having a very public love affair with the young aristocrat Silius that eventually ruins her. In a book that also treats German, eastern, and other Roman internal affairs, a third of the surviving narrative is devoted to the destruction of Messalina. Here we encounter the classic portrayal of a Claudius ignorant and manipulated by those around him in an extended narrative that shows Tacitus at his dramatic and cynical best. This edition of Book 11, the first scholarly one in English in over a hundred years, contains a full introduction, a newly-edited Latin text with apparatus, and a comprehensive commentary that illuminates historical, historiographical, textual, linguistic, and literary issues that arise from the narrative. '... extremely useful and enlightening, with excellent introductions to the different episodes or scenes of book 11 ... It deals with all matters that will help the reader reach a better understanding of the Tacitean text.' Antonio Ramirez de Verger, Bryn Mawr Classical Review "... extremely useful and enlightening, with excellent introductions to the different episodes or scenes of book 11 ... It deals with all matters that will help the reader reach a better understanding of the Tacitean text." 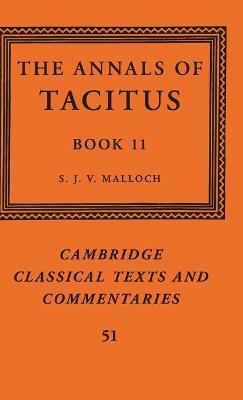 S. J. V. Malloch is Lecturer in Roman History at the Department of Classics, University of Nottingham.